The Bowes Team: Committed to Community. Committed to Family. Our team is much more than just Realtors®. We're parents, volunteers, coach's, EMT's, retired fire fighters and community leaders. Our commitment to community and family is so strong, that we've incorporated them both into our core values! As such, we're proud to support the Child & Family Agency of Southeastern CT at their 11th Annual Touch-A-Truck. The Child & Family Agency of Southeastern CT offers programs that support children’s physical healthcare, mental health, the prevention of child abuse, the treatment of family violence, teen pregnancy, parent education, child guidance, and childcare. With a heritage that dates from 1809, the agency has grown to become the largest non-profit children’s social service provider in Southeastern Connecticut. Their staff includes dedicated physicians, nurse practitioners, psychiatrists, masters-level behavioral health clinicians, teachers, community workers, and administrative and support personnel at various child care facilities, after-school programs, outpatient clinics and school-based health centers. 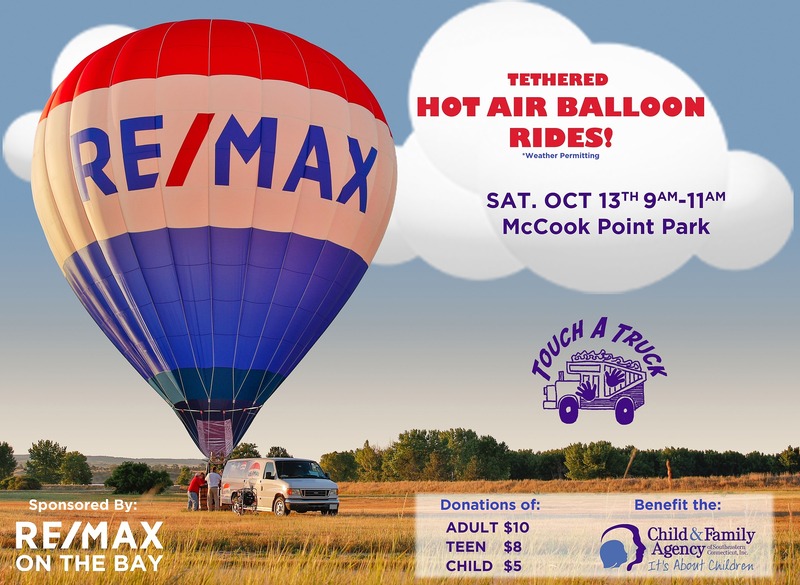 Join us on Saturday, October 13th from 9am to 11am at McCook Point Park while we offer Tethered Hot Air Balloon Rides to event attendees. Donations of $10 for Adults, $8 for Teens, and $5 for Children will get you the opportunity to experience floating Above The Crowd® while raising money for a great cause. From 9am-2pm additional activities at Touch-A-Truck include Food, Face Painting, Hair Beading, Arts & Crafts, Balloon Animals, Rides from Roaming Railroad, and of course the opportunity to climb into the driver's seat of various trucks. We hope you can join us! *All flights weather and wind permitting. Maximum 4 passengers per flight. Weight restrictions apply.